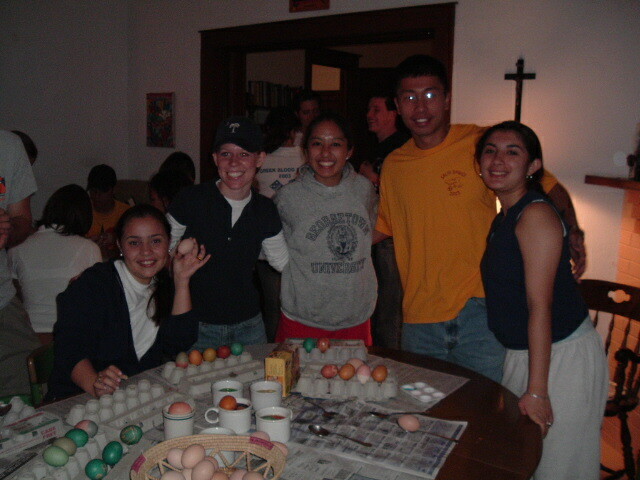 Liliana, Kelly, Jacqueline and Nam at the pre-Easter Breakfast Brigade in 2005. They were dyeing the eggs we’d later take to the labor pools. PIZZAS NEEDED: This Wednesday will be our last cafe of the 2011-2012 year, which means: PIZZAS! If you’d like to participate in Pizza Cafe Extravaganza III, we would love to have your help. Mainly what we need are pizzas. We will dish out somewhere between 15-25 pies over the course of three hours, so we need folks committed to bringing homemade pizzas or pizzas from one of our fine local pizzerias. Please let us know if you can bake and bring a homemade pizza or pick one (or more) up from our local pizzerias (Big Lou’s is right downtown, as is Five Star; Mamma Mia and Italian Gator are both close by too.) It’s important that we know how many pies will be coming so we’ll have enough, so please email us and let us know if you’ll be bringing some! And don’t forget to come and eat! AFTER TWELVE YEARS, THE BREAKFAST BRIGADE COMES TO AN END: Friday will be our last Breakfast Brigade. As we’ve told you over the past few weeks, numbers have been consistently going down over the past few years and we’ve decided to end the Brigade and take on a new project in the fall. We’d like to put together a slideshow for the website of photos from the Brigade over the years, as well as some folks remembrances or comments about the Brigade. If you have any photos you want to share, or if you have a few moments and can share a short story or something you remember about the Brigade, please send them to us at gvillecw@yahoo.com. John will put the info together over the summer and we’ll post it on the website later in the summer when we re-open. To everyone that has ever helped with the Brigade, we are so grateful! HELP US GET THE HOUSE TENTED FOR TERMITES THIS SUMMER: After having four additional inspections this past week, it is clear that we’ve got termites, and that we’ve got them bad enough that we need to get tented this summer. The good news is that we did find a better price on getting the house tented. The cost will still be more than we have available in our budget, but some folks have already sent in checks (thanks!) and we’re hopeful that some of you who are in a position to do so will also send in an extra gift to help us cover the $3,000 cost. If you can help, send your checks in to the GCW, 218 NW 2nd Ave, Gainesville, FL 32601. And thanks again! This will be our last week of origanized projects at the house. We’ll still be open next week to tie up a few loose ends, but we’ll officially start our summer break on Sunday, June 10. Daniel and John will be caretaking the house over the summer, and we’ll reopen the first week of August when our community members for next year–Gloria, Clayton, Leroy and Vickie–start moving in. TERMITE UPDATE: Thanks so much to the folks who already responded to our appeal to help get the house tented for termites. (This past weekend we sent out an appeal, upon learning we had termites and after meeting with a pest control company.) But you can hold on for a little while before sending thos checks as we might be pursuing another option. Jade, one of our extended community members, has some expertise in this area and is going to meet with the pest control company and see if there might be a cheaper alternative. If we need to go ahead with the tenting, we’ll send out another appeal. And if you sent a check already specifically for the tenting, let us know and we’ll hold it until we’re sure about how we’re proceeding. Thanks again folks! STOVE UPDATE: And within hours of our appeal going out, we had someone donate a used stove to us! Thanks to Helen and Flo for connecting us with their friends who just had a new stove put in and were willing to give us their old one. I am going to pick it up later this afternoon! PIZZA, PIZZA: In what is quickly becoming a GCW tradition, our last cafe this spring will feature homemade and local pizza pies! If you’d like to participate in Pizza Cafe Extravaganza III, next week on Wednesday, May 30, we would love to have the help. Here is how it works: 1) Let us know if you plan to make a homemade pizza pie or buy one from a local pizzeria (Big Lou’s is right downtown, as is Five Star; Mamma Mia and Italian Gator are both close by too…), and how many pies you will be making or buying; and 2) let us know when you’ll be bringing your pie(s) to the cafe (between 11:45am and 2pm). If you’d like to make a homemade pie on site, be here by 10am on Wednesday, May 30, and we’ll have all the fixings ready for you. It’s important that we know how many pies will be coming so we’ll have enough, so please email us and let us know if you’ll be bringing some! END OF YEAR COUNTDOWN: We have just two cafes and two Breakfast Brigades left before we go on summer sabbatical. Let me know if you want to help out with either one. We can especially use at least 2-3 more people for the last EVER Brigade on June 1. If you still want to help out, there will be weekly workdays at the micro-farm on Saturdays, from roughly 9am to 1pm, all summer long. June 8 will be our last “open” day here at the house, and we’ll “re-open” and start things back up beginning on July 31 when Clayton and Gloria, our new live-in community members, move in. BREAKFAST BRIGADE VOLUNTEERS? As we announced last week, this will be the final month for the Breakfast Brigade. But we need to know we’ll have enough volunteers for the last 4 Fridays in order to keep it going this month. If you can commit to one or more of these dates (May 11, 18, 25 and June 1), we need to know. So far, we have only 2 people scheduled for this Friday. Send us an email if you want to sign up for one the last BBs. 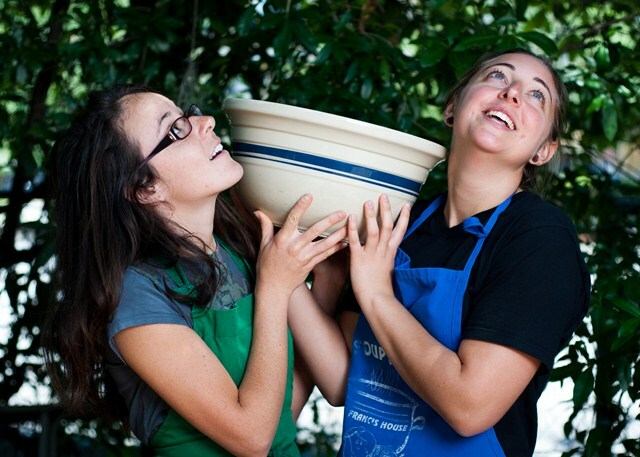 FARMERS’ MARKET CAFE VOLUNTEERS: We’re also in need of a few morning volunteers this coming Wednesday (tomorrow). We’ll be short three of our regulars, so we need a little extra help between 9:30 and noon. Email us if you can help out! You can leave items by the back side door if no one is at home when you drop off. Have a great week!